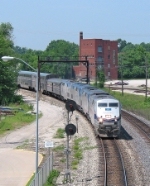 Description: #55 departs Springfield station. Description: The Vermonter goes west and then south at Springfield. Description: Still in NEC colors! Description: The eastbound Empire Builder makes a stop at the Vancouver Amtrak Station. Description: RUNNING WEST TO MILWAUKEE,AT KENOSHA WI. Description: #8, Eng 97 crosses Capital Dr in Pewaukee, WI as it heads east to Milwaukee. Description: The Snow is just picking up. As of 12/14/05 this unit hit a car on 6(13) and derailed no one injured though. Title: 81 and 97 waiting for the Signal to go. Description: The train was severely delayed in Illinois due to some very severe weather in the St. Louis Area last night. There's Station Caretaker Dennis Glaze taking a look at the train coming in with some young passengers.